Students and staff at Rainford High have raised an incredible £1748.88 for Run with George and Alder Hey Children’s charities. Rainford High welcomed George Mathias and family into the school for a special charity event. 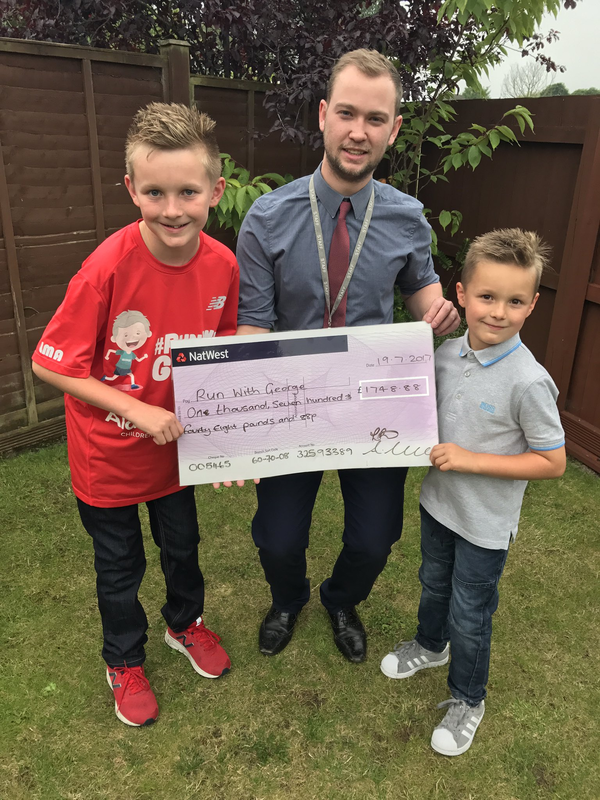 George Mathias is a young boy from Eccleston who began his ‘Run with George’ charity after deciding that he wanted to raise money for Alder Hey Children’s Hospital. The hospital looked after George’s younger brother James who was born premature and ended up in a coma. The hospital saved James’ life so George wanted to thank Alder Hey and try and help other children by running a mile for every month he has had his brother. The ‘Run with George’ initiative has become an incredibly popular and ever-growing charity and Rainford High wanted to show their support. Year 7 students and staff completed George’s 72nd mile with George and his little brother James. In the weeks leading up to the event, students and teachers indulged in cake sales, bought raffle tickets and took part in games around school, in order to raise funds for Alder Hey Children’s Charity. On the big day, year 7 started with an assembly, where they got to know the Mathias family and found out about some of the many celebrity names that George has run with so far this year, which include Paddy McGuiness, Jason Manford and Jamie Carragher. Heading to the start line, Principle Ian Young made his way to lead the race along with Mr Stow and George himself. 1600 metres later, the run was over and students enjoyed an ice pop and a drink whilst waiting patiently for the raffle to begin. Students won prizes such as: a Nintendo 3DS, a signed rugby ball, Run with George t-shirts and free family passes into Silver Blades Ice Rink, St Helens World of Glass and swimming at Queens Park Health and Fitness Centre. For more information, or to donate, visit www.runwithgeorge.com or follow @RunWithGeorgeUK on Twitter.